We only went to Moscow - but it was fantastic. As others have said, it's well worth a visit. It far exceeded our expectations in every respect - a beautiful city of amazing architecture & lovely sights; lots to see; cheap accommodation (despite prices apparently rocketing for the world cup); very cheap food & drink; & welcoming & hospitable people. Definitely recommended. I went to Siberia every summer for trekking for about 10 years. Never been in winter. Its definitely worth going, at least once in a lifetime. @Weathercam, Gird your loins for the process of getting a visa. It’s long, tedious, expensive and involves a trip to an embassy or visa centre just to lodge your fingerprints. How right you were, and still not really over! For those that may not know - you have to have a letter of invitation from the people / tour op you're going to be staying with which has a lot of the detail that you need for the Visa application. So if you don't have that you simply can't apply and if you happen to want to travel in the not too far off distant future you need to bear in mind you will not have your passport for up to 20 days - so yesterday had to fork out £185 for the express service as I'm going back to France week after next! And the questions on the form !! If you have children list their passports. Clearly I was not in a position to have all the info and I don't think it will be an issue (fingers crossed) as the girl behind the counter did not pull me up on the lack of answers. So back up to London next week to pick passport up, and luckily have to go there anyway. Tis quite weird thinking about logistics* to get yourself prepared to be off in seven weeks time. It's true you need a letter of invitation. However, there are lots of travel agents that will make you a letter of invitation for a small fee. Most independent travellers do it this way as they don't have any kind of tour booked. It's not much different to most things in life. If you want the cheap rate it takes longer. If you are in a rush you can do it faster but it costs more. Also 20 days is the absolute maximum, its normally a lot closer to the 5 days than the 5-20 they quote. They are all pretty standard visa questions you will get on the majority of visa forms. I don't think there's any questions there that I can't see a good reason for asking. While it's a small hassle there are definitely places a lot more complicated for getting visas. In fact the only thing the sticks out about the Russian visa being more problematic than an average visa is the fact it's nearly impossible to get outside your home country (which may or may not be an issue). @boarder2020, did see various other ways of getting the "invitation" but I knew it was coming. This is a good site https://russiable.co.uk/getting-russian-visa-united-kingdom/ with links to those co's that can do it. OH & daughter did visa for India and was no where near as complex, plus for many visas you don't have to go in person! Though was reading China and Iran tad more complex. And ten or 20 days etc I just could not risk it! Yes I don't blame you for doing the express version in your circumstances. It was more a comment for people considering going in future, that the process usually doesn't take 20 days. India is not too bad as it is an evisa - you just fill out the form online, pay your money, and then take the print out to exchange for the visa on arrival. Have not done an Indian visa for a few years so maybe more streamlined now, but forms were pretty long and featured all the same type of questions as Russia. Some countries ask for lots more (bank statements, proof of flights in and out the country, accomodation bookings etc.). Some you have to go to specific embassies in a third country. If you're not used to visas russian is probably a bit of an ordeal, but it's not that bad in comparison to some, definitely shouldn't put people off going. Did you hear the one about the Russian Tour Op that sent the wrong dates (and only to me) with the net result of then having to apply for a new visa and nigh on another £200 and two more trips to London. Beginning to get a tad "stoked"
If you haven't already seen it check out the Sherpa studios ski video - the Siberian traverse. It's free and YouTube and should get you stoked. They do a backcountry lodge segment which may even be the same area you are going. @Weathercam, There's no real question here. I couldn't go 'cos of family history etc. . . . but I would bite off and BBQ my right nut for the opportunity. There are few unique opportunities available to most of us great unwashed. This is one of them. Be aware that it will be 'RUSTIC' . . . in all senses of the word . . . and take with you repair components for anything that is essential and may break . . . even better, try to co-ordinate your equipment so that there is redundancy within the group. Siberia is where the Soviets sent their citizens for punishment. Good luck. @Weathercam, I'm jealous! what a fantastic way to kick off the season. Excellent for us anyway, I predict record snowfall in the Alps for mid November. Russian visa applications ask for a list of all countries you have visited in the last ten years and entry/exit dates of each and every visit. That seems a litle excessive to me and, if I had spent a year in somewhere dodgy, I probably wouldn't include it on the list anyway. You can actually get away with providing far less than the full list but not everyone knows that. Of course visa forms are often bureaucracy for the sake of it, so you can often get away with putting far less information than needed (or even false information). An example would be Chinese visa where many people use fake flight and hotel bookings to get the visa. The problem you would have is that you've been somewhere "dodgy" you probably have a nice big visa/stamp in your passport. If the person doing your application sees that you've been somewhere dodgy and not mentioned it you may well get your application rejected. Mention it and they probably won't care, or will contact you for further info. To be honest I would rather provide my travel history (really not such a huge deal) than them have a blanket ban that excludes everyone that's been to certain countries. I'm in a situation now where I'm not eligible for USA esta because I've simply visited a country they don't like. I don't have sufficient ties to UK for the full usa tourist visa, so basically can't go. So the Russian policy does not seem so bad, and is still a lot easier than a number of other visas. I accept if you travel to more "regular" countries russian visa may seem excessive and complicated, but compared to a lot of others it's similar and still easier than some. @davidof, you could also have added and "warmest start to the winter in Siberia since records began"
And re the Visa application listing countries visited in the last ten years - I just listed last three years. At the Visa office they do go through the application quite thoroughly before passing it on to the Embassy for approval so any issues they would then point them out. So travel in shorts and softshell trousers, use blankets on plane etc and gloves / socks stuffed into boots etc wasn't planning on taking too many clothes anyway. Road book, Luzhba Skitouring Lodge. Dear guest. To ensure that your trip to Siberia goes smoothly and brings only positive emotions, please check our travel recommendation and logistic information, also please check the Gear section in program description. http://skiinginsiberia.com/skitouring/luzhba/ to make sure, that you have all necessary gear. We strongly suggest using the duffle/roller duffle for carrying your stuff. Plastic/leather suitcase can be damaged during the snowmobile transportation with low temperature and bumpy ride, and we are not responsible for it. We also suggest carrying your ski boots as a part of cabin luggage, as well as pants/jacket. Usually air companies allow carrying boots as extra piece of cabin luggage. 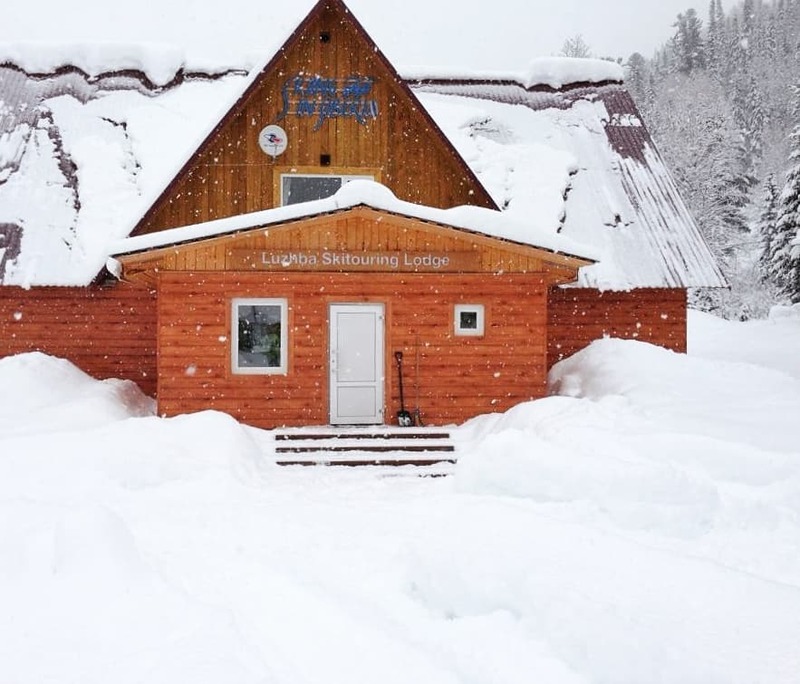 The reason to do it – if your luggage is delayed or lost (see below), we have some extra skis in the lodge, and you will be able to ski and not lose your days. But we don’t have any boots available. On Saturday, on arrival to Abakan airport (after overnight flight from Moscow), on the exit of luggage delivery you will be met by our Englishspeaking representative Alexandra, with the “Skiing in Siberia” sign. In some cases it can be only driver, who speaks English not really good, but can connect you with some of our staff within a few minutes. Then you ride in a bus to the restaurant “Mama Roma”, where you will have buffet breakfast and will be able to order sandwiches to take away (recommended, cause you will arrive to Luzhba late afternoon). At 10:30, you will leave the restaurant and then ride to Biskamzha train station, for 2.5 hours. There you will be met by our staff from the lodge, who will help with suburban train and rest of logistic. The train to Luzhba departs at 13:56 local time and arrives to Luzhba station at 15:30. At Luzhba train station, all your luggage will be carried by snowmobile to the lodge, while we walk there (20 minutes.). Please, be properly dressed for the walking in the snow (high snow shoes!) and for low temperatures. That is pretty much the same visa process for all dictator or paranoid states, like Russia, China, India, etc. You need to think ahead more, son. That is pretty much the same visa process for all dictator or paranoid states, like USA, Russia, China, India, etc. 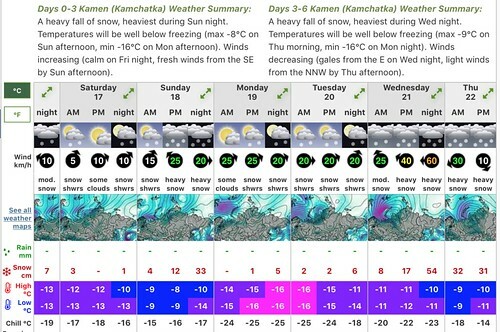 @Weathercam, Hope you have a nice trip, Scotland and Kamchatka do have something in common. 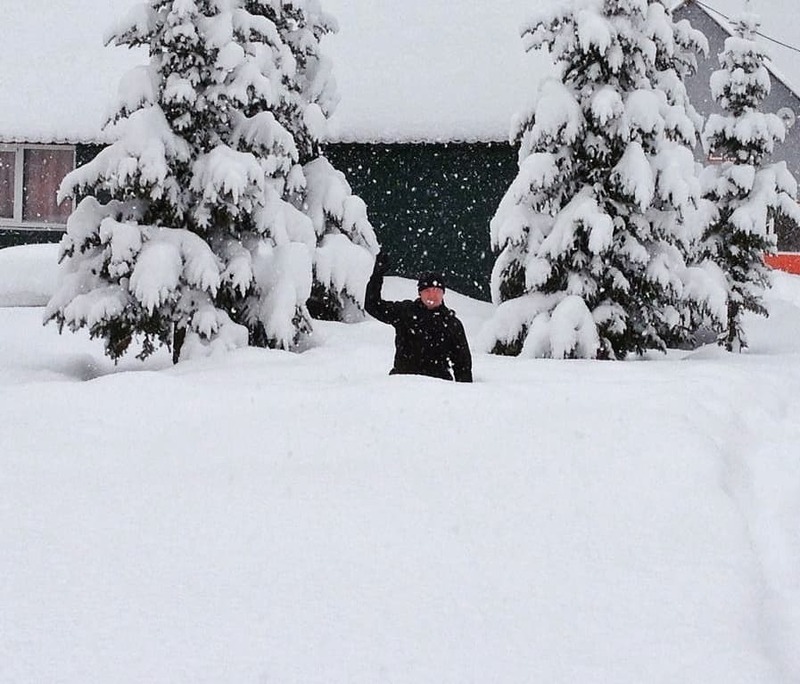 Heavy snowfall predicted in Luschba area for coming weekend! Temperatures are expected to drop way below 0 C.
Also I just learned that hut slippers is a good thing to bring. And very important, as it is very early season and quite far north, please bring a head lamp with extra batteries. As it is cold temperatures and we are couning on 2-3 climbs a day, if you do have a pair of extra skins it might be worth bringing them. Wanted to go to similar destination, but scared by -20 -30. at these temperatures you should be very careful with yourself and your equipment. Also beware of tree wells. Good luck with your journey. They're gonna need a bigger shovel! He's moved his flights to Saturday but me thinks it ain't going to happen. But it's snowing, cold temps and mega Pow and we have maybe a better replacement ??? A guide who failed the first test on actually getting there, hope the trip improves, looks potentially epic with the current snowpack! He's still hoping the passport will turn up today, but sounds like he's one of six who has gone missing. Been snowing heavy overnight according to their Instagram. Snowing hard (10 cm per hour!) at #LuzhbaSkitouringLodge. Very excited about tomorrow. Stay tuned! Arrived here after a very long journey. Tad spaced out now due to not a lot of sleep and now 7hrs ahead of UK time. One of the team had their ABS trigger and canister confiscated by Aeroflot at Heathrow after many phonecalls back to head office and Moscow. First day and pretty damn good. We were joined by a guide from Verbier and his wife and Dimi the guide who's been here past five or so years so worked out well. Strong team with the Swedes. Snow just like Japan, reckon 80 - 150 and with these temps cold and smoking! And viz remarkably good at times. Can't post pics as websites are very hard work whist social media not too bad. OH might post them on Style Altitude. Never seen so many Diamir Tectons, Vipecs etc with all the Swiss. Even two of the guides use them! Five climbs totally just over 1,000m so transitions a plenty. Nice easy pace as name of the game is not to get a sweat up as you might freeze when stopping for transition, but really not too bad. Once back down hearty soup at 16.00 sauna banya time 17:00 to 19:00 and dinner at 20.00 and there's a good selection of beers and almost cheap! More of the same tomorrow! This thread is useless without pictures! @Weathercam, defo need pics Is the snow as reliable as Japan? We're only about 5hrs flying from Kamchutka we're slap bang in the middle of Russia. I honestly had no idea how huge this country is, how the the hell Adolf ever thought he could defeat Russia? Powder light and smoking trails.